Rabat Ajax - 1984-85 season. (Standing) R. Scerri, M. Scicluna, I. Filipov, A. McGonigle, E. Cortis. (Squatting) M. Zahra, E. Azzopardi, C. Busuttil, E. Caruana, C. Scerri, J. Borg. Twenty-five years have passed since Rabat Ajax FC changed name from Rabat FC. During this span, I wonder if there has ever been any other club on the islands which has had as much mixed fortunes as those of the Magpies. 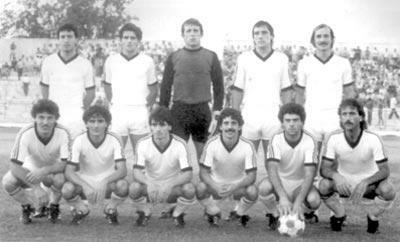 Rabat Ajax kicked off season 1980-81 in Division Two in great style. They won promotion and gave a clear indication that they had a team to compete with the best. The following season, they dominated the scene in Division One and finished undefeated champions and a clear eight points ahead of the second-placed team. Winning the KO competition completed the double. Premier League football came back to Rabat and with a host of young, talented and exciting players, the fans were anticipating great things from their side. After 17 long years, Rabat Ajax made their first appearance in top-flight football in 1982 and as expected by their loyal followers, they made their mark by finishing joint runners-up with Valletta behind Hamrun. The same second spot in the league table was retained the following year and that proved that the results achieved the previous seasons were no flash in the pan. However, the best was still to come the following two seasons as the additional of a couple of shrewd signings, the team was strengthened in no small measure. In such a short time, Rabat won all the trophies at stake in the local game. The Premier League was won twice in succession, the FA Trophy was lifted for the first time ever while the Super Cup and the Euro Cup were both won twice. Indeed, a remarkable achievement. Following this success and when every football lover on the island was talking about Rabat Ajax as being the team to beat, the most unexpected and baffling thing rocked the club. Fielding most of the players who had won everything in sight, the following 1986-87 season proved to be the most disastrous. Against all odds, the Magpies suffered relegation to Division One. The fans were stunned and they had every right to be. The glorious days became suddenly a thing of the past. Unrest crept within the club and the team was disintegrated with first team squad players leaving, either retiring or mostly transferred. A new era was to begin, but, unfortunately for the Magpies, things would never be the same again. Nowadays, there is a feeling that the club has taken a seesaw route, with the team being relegated and promoted in the lower divisions almost on a regular basis. By falling down to Division Three last season, the club has now reached the lowest point in their long history, including that of Rabat FC. But, hopefully, with a few upcoming lads, there is no reason why they could not make their way back to the higher divisions. Definitely, one stumbling block is a serious lack of finances which is hitting most clubs. Although I believe that it will take some time before I can see my favourite team play top-flight football again, I hope and augur that Rabat Ajax will find their rightful place in the not too distant future. During these last 25 years, Rabat Ajax played 521 competitive matches in 11 different categories winning 194; drawing 117; losing 210. Goals scored - 818; goals conceded - 890. The categories played were: League; Trophy/KO; Super Cup; Euro Cup; European Cup; UEFA Cup; Champions Pool decider; Championship Pool; Relegation Pool; Centenary Cup and Samaritani Cup. St George's (10); St Patrick (22); Sta Venera (2); Tarxien (10); Valletta (36); Vittoriosa (6); Xghajra (9); Zebbug (6); Zejtun (7); Zurrieq (34).